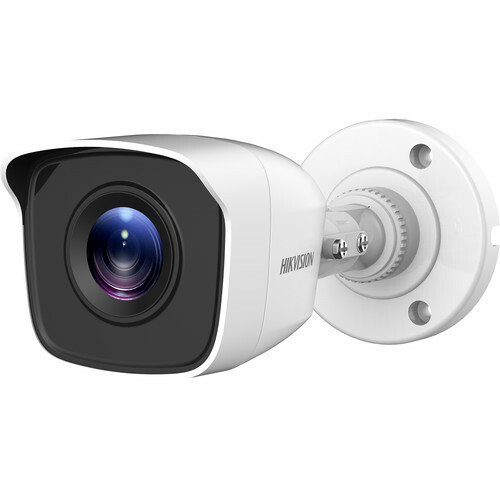 The ECT-B12F6 TurboHD 2MP Outdoor Analog HD Bullet Camera from Hikvision uses a 2MP CMOS image sensor to transmit 1920 x 1080 resolution video at up to 30 fps. EXIR 2.0 technology provides up to 65' of night vision. The camera's 6mm fixed lens delivers a 56.7° horizontal field of view. HD-TVI, HD-CVI, AHD, and CVBS signal outputs are supported. This bullet camera is housed in an IP66-rated metal enclosure that is suitable for outdoor use.